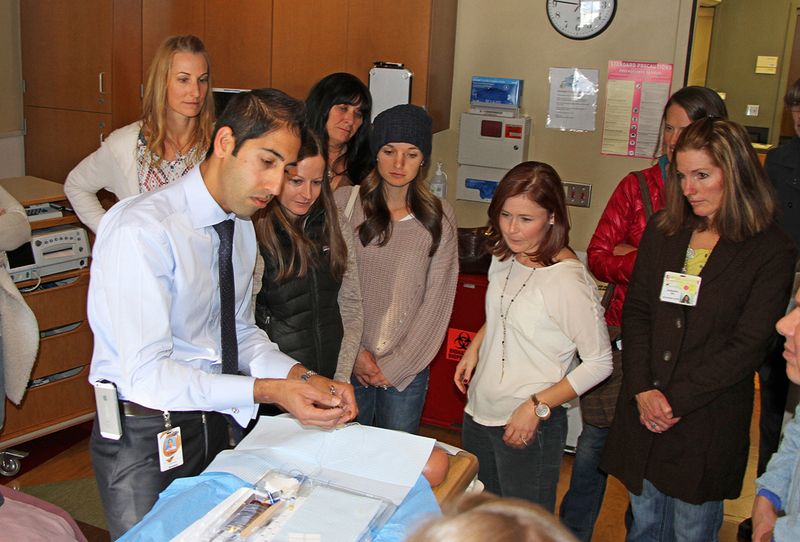 Mammoth Hospital recently invited a Neonatal Intensive Care Unit (NICU) team to Mammoth for a special training on life saving skills for newborn babies. Neonatologist, Dr. Anand Rajani from Community Regional Medical Center in Fresno led the instruction along with Neonatal Nurse Practitioner Abby Van Den Broeke and Respiratory Therapists Curt Partain and Hank Perry. Mammoth Hospital Labor and Delivery nurses and Pediatricians, ED physicians, and respiratory therapists participated in collaboration with a team of nurses and physicians from Northern Inyo Hospital. Teams were instructed on techniques including umbilical line placement, a procedure that enables quick access to an infant’s bloodstream to deliver lifesaving medications. Also demonstrated were neonatal IV placement for the nurses and various lectures on issues relevant to the critically ill newborn. For more information on Mammoth Hospital’s Birthing Center and Obstetric Specialties, please contact (760) 924-4044 or visit www.mammothhospital.com.